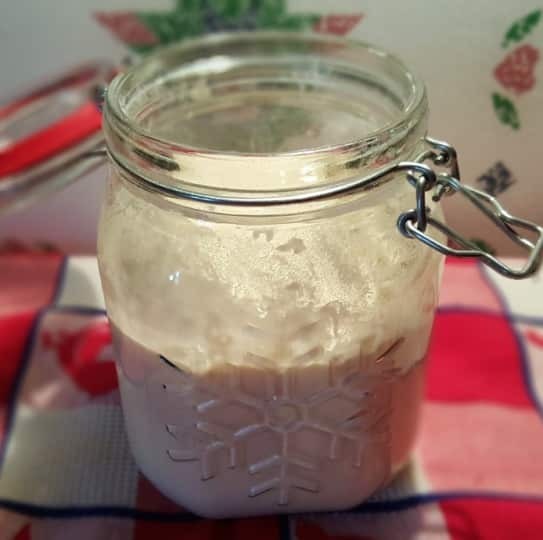 This Sourdough Starter Recipe is all you need to make your own homemade bread using natural fermentation. Give your tummy a break from processed bread. You will find all kinds of opinions on sourdough starter. I like to keep things simple. I keep a small amount of starter in my refrigerator since I only bake about once a week. Starter is alive and needs to be fed. Join my Facebook Group, Natural Fermentation Real Sourdough Bread Bakers. 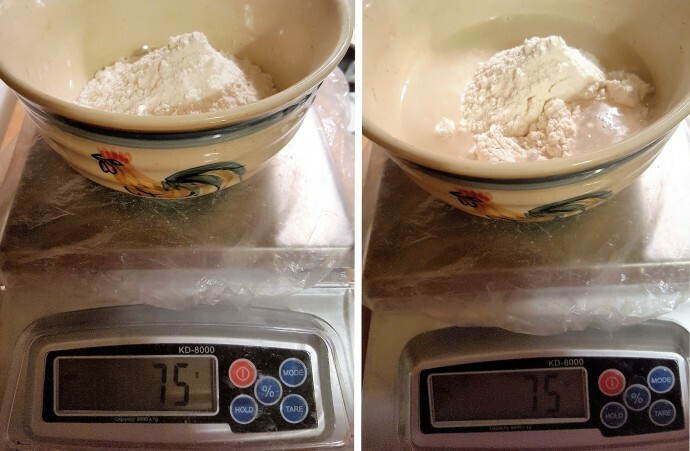 I have the Baker’s Math Kitchen Scale, which I absolutely love and always weigh in grams. Weigh your Flour and the fresh water. Whisk it all together. 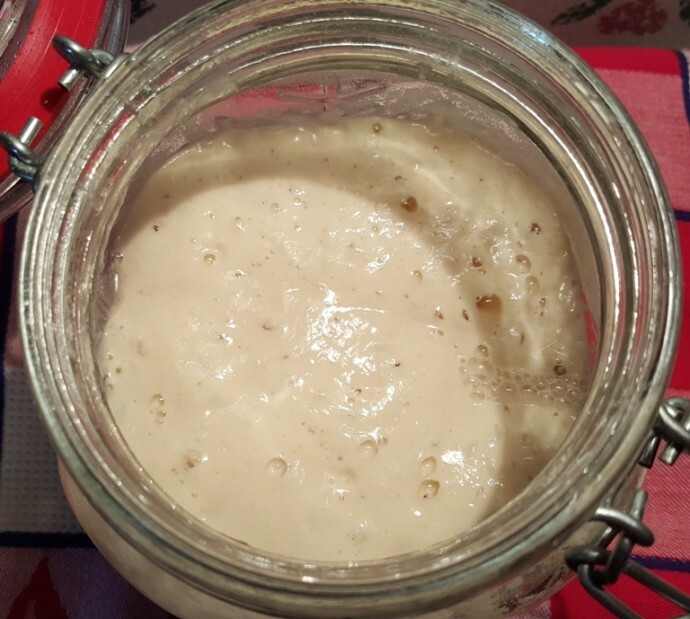 When you remove starter to use it or save it for discard, always feed equal amounts of Flour and water to keep a 100% Sourdough Starter. If you need a stiffer starter, you can easily adjust your starter, or you can keep a separate one. I like to use the Rosle Flat Stainless Steel Whisk when I prepare starter as it mixes really quickly and really well. Make sure all the Flour is mixed into the water. See how smooth this is? Cover the jar with a towel. 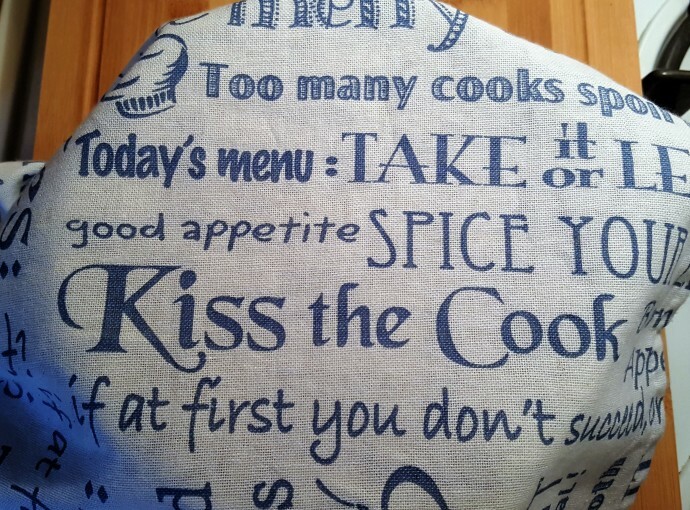 I like the Kay Dee Designs Tea Towels since they are light and cute. 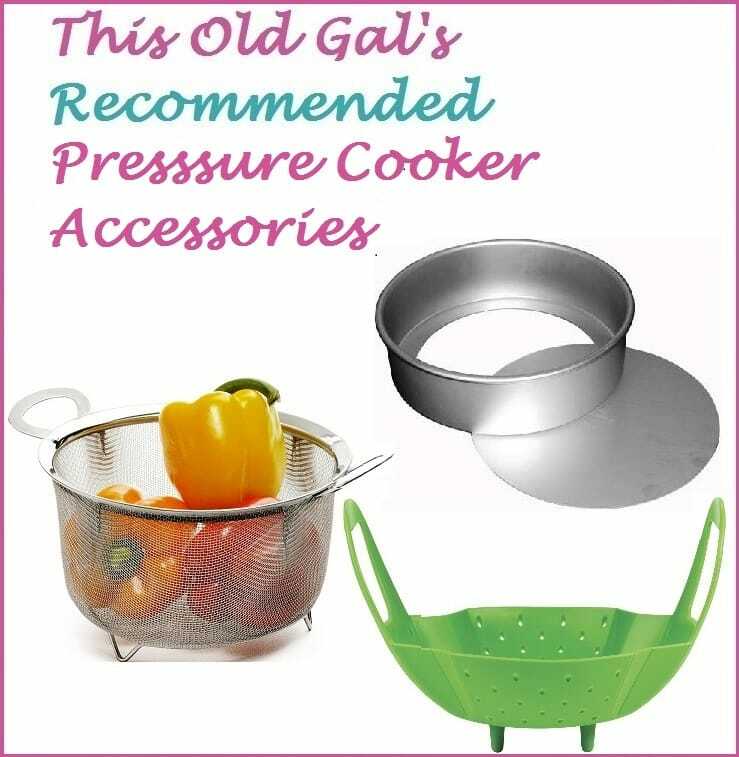 You will want to keep the jar in a warm place, like on your washing machine, dryer or even inside your oven. Twice a day (approximately every 12 hours) for two weeks, remove 50% of the starter and mix with 75 grams of water and all purpose flour. 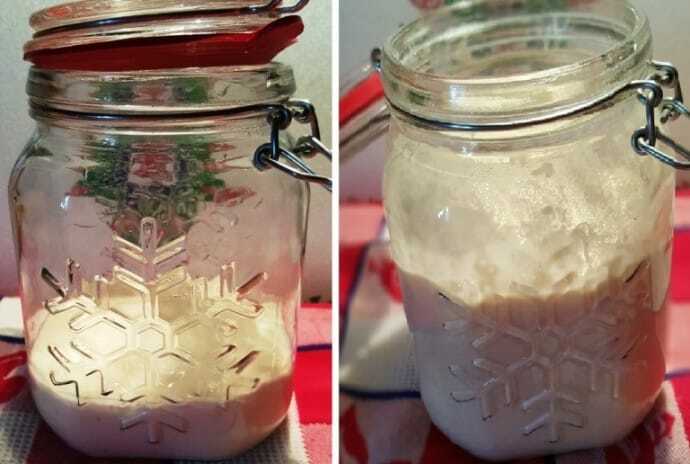 At this point, you can try using your Sourdough Starter in a recipe. My Country Sourdough Bread is a great place to start. If you plan to bake daily and want to leave your Starter on the counter, feed it daily by removing half and then feeding. If you plan to use once a week, place the Glass Jar with Rubber Gasket in the refrigerator after feeding and then take out what you need. Always feed your starter after using. If you do not plan to bake once a week at least, you will still need to feed your starter. I keep another glass jar in my refrigerator for “discard,” which I use to make pancakes, crumpets and other goodies. Your starter will triple in size, so make sure to use a large enough jar. More All Purpose Flour and Water for feeding. Mix together equal amounts of all purpose flour and water. Cover and place in warm part of home. Remove 50% of the starter and replace with equal amounts of water and all purpose flour. Do this every 12 hours for two weeks. 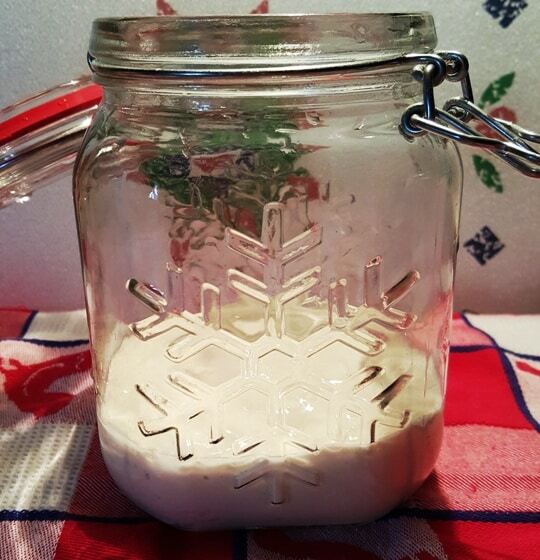 PIN this Sourdough Starter Recipe (Natural Fermentation)! Hello Jill, Love everything you do! I used to do a lot of sourdough when the kids were growing up; then I lost my starter and just never did it again. I had a K.A. starter at one point that we loved. I have two questions! 2. Will it be as good as the K.A. starter I bought years ago? It is winter in Michigan…need I say more! …and it is January! If it’s not suppose to be locked and mine has been made for 16 hours with a locked jar should I start over? I do have some bubbles after 16 hours. 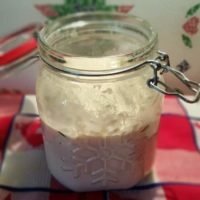 Can I use whey to make my sourdough starter? Since it’s winter, there really isn’t a warm place in my home. Do you know what temperature the instant pot is when it’s set to Yogurt-less? I don’t have a thermometer on hand and was wondering if that could provide a warm enough spot. Hello, when you said remove 50 % of the starter and remove it by equal amount of flour and water, do you mean ie 40g of flour and 35g of water ? I was curious about this too and went back and re-read, found the answer:). How much is 75 grams in terms of cups? It’s just shy of 1/3 cup. On the starter you say to remove 50% then add the water and flour for 2 weeks. Do you throw away the 50% each day for the next 2 weeks because it’s not ready to use? You said you use the discard for pancakes and crumpets. How long does the discard last in the fridge for that purpose? Still confused, Jill. Do you throw it away or use it for pancakes, etc. If you do use it, do you keep it refrigerated until you want to make the pancakes, etc? so, without any starter mix, or anything, the flour will naturally create a sourdough starter in 2 weeks if fed daily? That would be a starter. You said you keep your starter in the refridgerator if you only use it once a week. Do you still feed it daily, or just the day before? I wanted to use the sour dough starter in your Instant Pot Bread, but how do you do that? 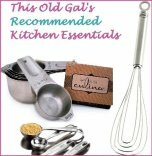 How much starter do I use per recipe? I assume this is to replace the yeast. Is that correct? How often must you feed a sour dough starter once you place it in the fridge in order to maintain it? When you feed it again, do you leave it on the counter or do you put it in the fridge?